I recently had a chance to visit the newly renovated Hamilton Princess and attend the grand opening of their new restaurant, Marcus’ featuring celebrity chef, Marcus Samuelsson. My biggest take-away from the experience? … This is not your grandmother’s Bermuda! The new owners of the Hamilton Princess, local Bermudian brothers Andrew and Alexander Green, are determined to attract a younger, more energetic market while staying true to the traditions and culture of Bermuda. They have invested $90 million in the overhaul of this property with a new infinity pool, newly renovated rooms, and an entirely new beach club. And, that is just phase one of their project; Phase 2 begins later this year when they start work on creating a new Exhale branded Spa and Fitness center. As a self-described foodie, the real draw for me was the opening of Marcus’. After a successful run at a pop-up restaurant last summer, it wasn’t surprising that the hotel and chef were doubling down on their partnership. Their commitment to this project showed in every detail. Marcus’ is incredible! I loved everything from the dining room decor to the melt-in-your mouth wahoo sashimi. Chef Marcus was on hand to shake hands and flash his charming smile; his excitement and sense of pride in this project was infectious. This restaurant is a destination in itself and worth the trip alone! 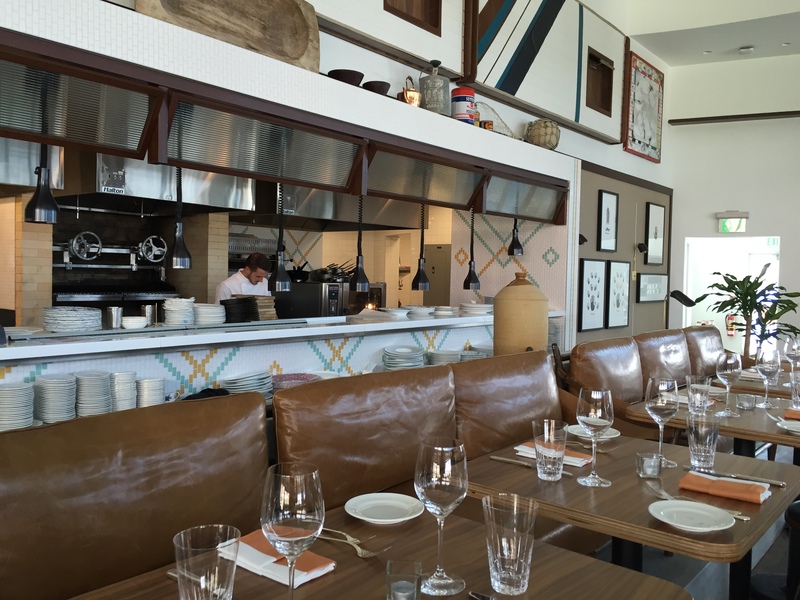 The Chef’s Table at Marcus’ – getting ready for the opening party! For more site-inspection pictures visit our Flickr album. The hotel itself is a complex combination of elements that took me some time to digest. It is a historic building (celebrating its 130th birthday this year), it is pink, and it is quite big with over 400 rooms. At first, I didn’t know what to expect. As I explored the property, the modern art, bright colors, and contemporary decor seemed to clash with the exterior … and my ill-informed expectations. Soon enough, the Hamilton Princess begins to unfold itself and its owners’ vision for its future. By the end of my stay, I not only saw this resort’s potential, but I had bought in 100%. There is still some work to do to complete the vision and create a cohesive environment, but they have all of the right pieces to this puzzle. I’ve already committed to returning to Hamilton Princess next summer to see the finished product and complete part 2 of this blog post! Fairmont Gold: I stayed in a Fairmont Gold room, which has the most traditional design of the room options. The decor been freshened up, but not fully renovated. It was nice, but nothing special. Since guests can add access to the Fairmont Gold Private Lounge to any reservation in any room category, I probably wouldn’t recommend this room category unless you specifically prefer the more traditional design. Bermudiana House: This wing is best for families and groups traveling together. It is the furthest removed from the main building and you don’t have to worry so much about disturbing neighbors with noise. The views of sink bay harbor are peaceful and serene and the rooms on the end of the wing feature views of Mark Twains house across the water. Ground floor rooms with private patios and easy access to the new infinity pool are perfect for families. Of all of the wings, Bermudiana House feels the most residential. Poinciana and Gazebo Wing: The rooms in these two wings are the most recently renovated and similar in design style. The Poinciana wing is best if you’re looking for easy pool access. The ground floor rooms either have access to the infinity pool or the lap pool (which will be integrated into the Spa). The Gazebo Wing is where you want to be if views are your top priority. Rooms on the top floors in this wing feature sweeping views of the hotel’s marina and the bay beyond. Gazebo Wing 1-bedroom Suites: For me, this is the sweet spot of all of the room options. These suites are large and laid out very smartly and feature an entry hall including a wet bar, a large living room with sleeper sofa (perfect for kids) and balcony, a bedroom with Juliette balcony, and a large bathroom. Upgrades will be hard to get into this category so if you want it, you need to book it outright. On top of all of this, the real kicker for me was the hotel’s new Princess Beach Club. This is a short jitney ride away from the hotel and it is worth the trip. The beach club is located on an extremely private cove with calm ocean water. At low tide, the water never reached my shoulders; I could walk across the entire bay. 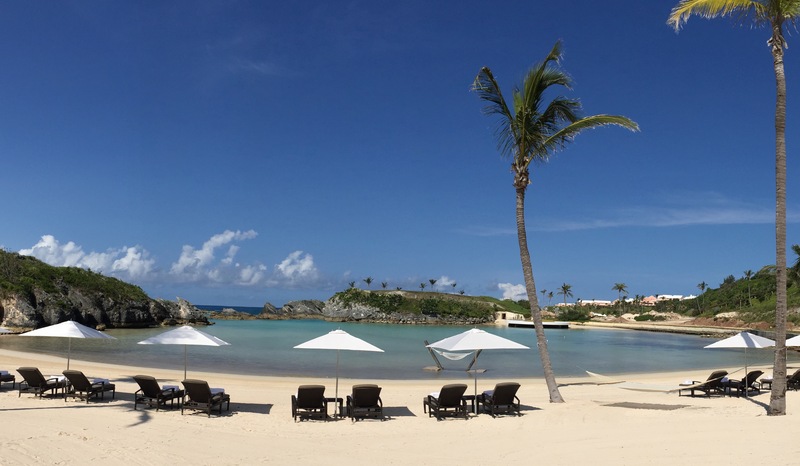 The Beach Club menu features dishes designed by Chef Marcus, the color of the ocean is a breathtaking turquoise blue and the over-water hammock is prime real-estate for whiling away the hours … this is a real gem in Bermuda! 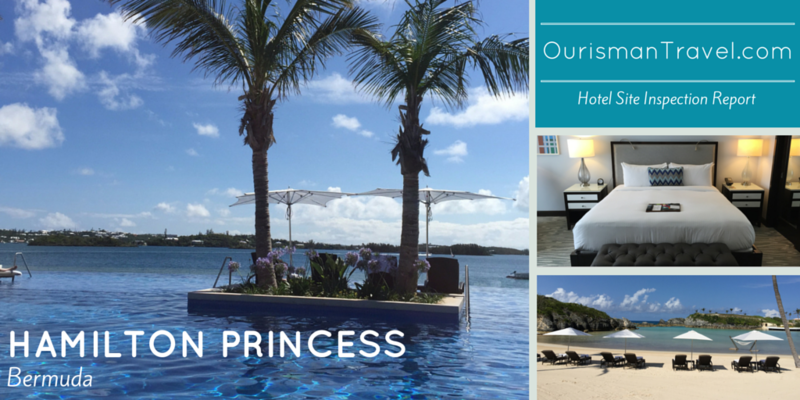 Contact us if you’re ready to plan your trip to the Hamilton Princess Bermuda! 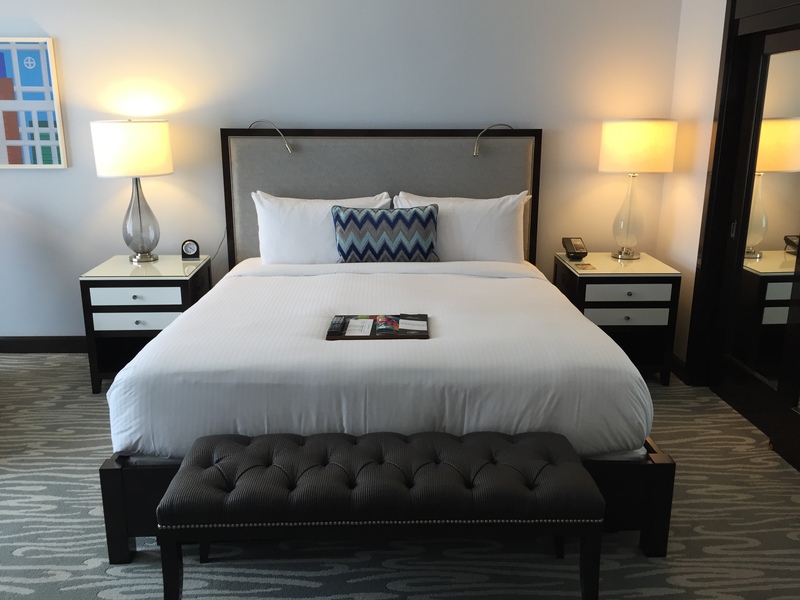 This entry was posted in Beaches, Hotel Reviews and tagged Bermuda, Caribbean, Fairmont, hotel review. Bookmark the permalink.